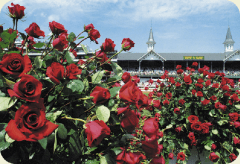 Our friends over at Kentucky Confidential are live-blogging the races and events this Derby Day. Make sure to check out their site for the latest goings on at Churchill Downs. John Scheinman sits down for coffee with Kerry Thomas, author of “Horse Profiling: The Secret to Motivating Equine Athletes.” Thomas describes how he assesses horse behavior and who he likes in this year’s Kentucky Derby. To watch the video, visit Kentucky Confidential. John Scheinman talks with former jockey Richard Migliore about his Derby experiences, his new career as a TV analyst and his top choices for Kentucky Derby 138. To watch the interview, visit Kentucky Confidential. John Scheinman and Paulick Report editor Scott Jagow hit the backside as preparations ramp up for Kentucky Derby 138. Scheinman talks to trainer Dale Romans about Dullahan, one of this year’s top contenders, and about the potential Derby pace. To see the interview, go to Kentucky Confidential.